Cases of famine, governmental overreach, political abuse and neglect persist even in today's globalised world. Corporate malfeasance, disregard of the environment, and blatant ignorance of the instigators of disasters large and small also continue to register high human costs. In trying to address this, theorists have attempted to elucidate a global ethics that would prescribe courses of actions even when individual and direct causal agency cannot be identified. Following in this tradition, Eddy M. Souffrant explores the concept of a global development ethics, taking in topics including famine, immigration, capitalism, race, and technology. 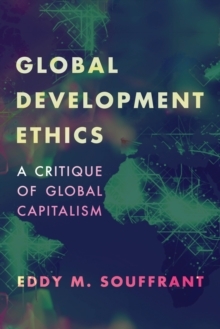 He demonstrates that defining the constituents of a global development ethics depends on a successful analysis of the theoretical and practical structures that cause such global and seemingly intractable conditions. He challenges existing conceptions of global justice and argues for a theory of global ethics that relies on our commonality, such that enables us to welcome the `other', thereby fuelling our recognition of the inequalities that motivate prospective development projects. Ideal for advanced-level students in global ethics, global justice and development studies, this text articulates a vital new ethics of human development.